Three more injured South African goldminers have been brought to the surface but one remains underground and another killed after a big earthquake. 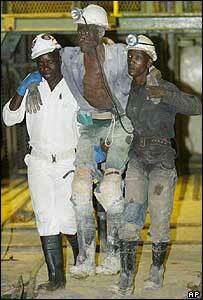 The three were brought out of the mine on stretchers and covered in dirt, reports Reuters news agency. Earlier, thirty-three others were rescued. Frantic efforts continue to save the missing miner, who has been located. The earthquake, with a magnitude of five, struck on Wednesday, leaving 21 local families homeless. "You can see the elation on their faces. It's a reward in itself," said Darren Vorkel, leader of one of the rescue teams that spent hours shifting rock to reach the men more than 2km below the surface in Stilfontein, some 155km south-west of Johannesburg. "There's a lot of broken rock, sporadic falls, it's very hot," he said after emerging from an overnight rescue operation. "There was shaking. It was very quick - maybe less than a minute," miner Tsebeletso Tseko told Reuters, showing cuts on his hands and arms. "By that time, I was covered with rocks. I felt afraid." Mine owner DRDGold has some 3,200 miners in the area affected by the quake, most of whom were evacuated. South Africa's fourth largest gold producer has now resumed operations in some parts of the mine but the shaft where the accident happened remains closed. In the nearby towns of Stilfontein and Klerksdorp, 38 people suffered minor injuries and 21 families were left homeless after damage to the walls of two housing blocks, officials said. The shopping centre in Stilfontein was sealed off overnight by police to prevent an outbreak of looting, Reuters reports. Many buildings showed minor damage, with cracks in walls and broken roof tiles. Pupils at two schools were sent home after walls were damaged. Large earthquakes are not common in South Africa and one seismologist said it could have been triggered by underground mining operations. "This is most probably a mining-induced event... it is a gold mining area," said Council for Geoscience seismologist Eldridge Kgaswane. He said that mine work triggered small earthquakes on an almost daily basis.